My absolute favorite part of the OSCAR research experience has been putting together the data collected and analyzing it for meaning. In this photograph, I was presenting the culmination of the entire summer’s research project at the Potomac Environmental Research and Education Center (PEREC). It was such an amazing experience to be able to perform my own research, connect the dots of all the data, and be able to say, “This is what I now know about this research that was unknown before”. It was truly an awe-inspiring feeling! (Even if it left me with 20 more questions than I had had before). And now for a bit of shameless ego stroking. I was particularly proud of the food web I created in this photograph. This specifically filled me with pride as it combined several different avenues of research into a singular cohesive, meaningful piece. I took the results from the stable isotope analysis and combined them with the results of the stomach content analysis to create a food web. This food web displayed input percentages of carbon and nitrogen from external sources into the aquatic ecosystem, calculated the specific trophic levels of each organism, and connected each organism to its consumer. By doing this, we can now see what is coming into the food web from where, and how it is moving through the food web once it has entered. To me, that is pretty darn cool. One of my long-term goals has always been to do something for the community. I spent years trying to figure out the best way to give back. Eventually, I realized that science would be a great way to contribute. After my stint in the US Army, I went on to pursue my undergraduate degree in Chemistry. I am projected to graduate from George Mason with my Chemistry B.S with a concentration in Analytical and Environmental Chemistry. I took a class called Aquatic Chemistry with Dr. Foster, and it has inspired to me to learn more about water quality and to pursue research. Dr. Foster’s and Dr. Huff’s laboratory were we have spent the last few weeks working on sample prep. When I saw this summer research project “Fate of Pharmaceuticals and Personal Care Products in the Potomac River” funded by OSCAR on a flyer in Exploratory Hall, I knew I wanted to be on the Chemistry team. For the past seven weeks, I have been in the chemistry laboratory at the Potomac Science Center in Woodbridge doing sample preparation. In our chemistry team, we were split into three different groups each with two people. Each group was responsible for prepping specific samples that were collected by the ecology team. The end goal is to be able to identify and quantify the very small amounts of various PPCPs (Pharmaceuticals and Personal Care Products) from the samples. The target area in the Potomac River we are focusing on is Gunston Cove. My laboratory partner, Robert, and I were assigned to do sediment, submerged aquatic vegetation, and clam (Corbicula) samples. Team one was assigned water and plankton, and team three was assigned fish. Every Monday, the Chemistry and Ecology team has met in a lecture room where we have been given various lectures from our advisor. On other days, the beginning of my day has usually started with a Chemistry team meeting with Dr. Foster and Dr. Huff and the research assistants, Tovga Haji, Tabitha King, and Jonathan Raisigel. It is a way for each group to communicate with each other. Often, the meeting is where we have been brainstorming ideas to solve problems that come up. After the morning lecture or team meeting, I usually spend the rest of my day in the laboratory. The laboratory is a busy place with many different things going on, which was overwhelming at first. However, with the help of the research assistants and the graduate students, we were able to integrate seemingly over time. They were instrumental in teaching us the extraction methods for each type of sample that they have helped refine over time. Homogenizing clam samples using the homogenizer. My journey in the laboratory began with the samples collected from Gunston Cove. We used a refined mesh screen, which in technical terms was a 500 µm sieve, to separate out the larger particles in the sediment samples. For clams, we start with working with the ecology to team to harvest the clams from their shells, which involved a hammer and lot of arm strength and patience. As someone who had a strong aversion to seafood, this was the most challenging part. We would then take the clams and used a homogenizer to blend the clams to a uniformed consistency. 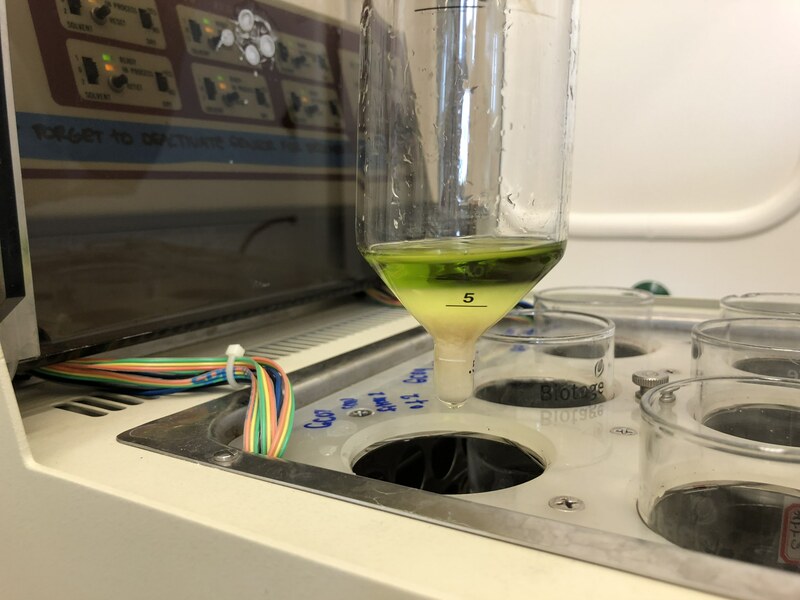 The submerged aquatic vegetation (SAV) was an adventure because we found that it was impossible to get it to a uniformed consistency using the homogenizer. However, I recalled that for smoothies, I would use the blender to blend fresh kale and celery, which always worked amazingly. So, we took a regular blender that was used for the fish samples and used it to blend our SAV samples. Success! Clam samples after the addition of salt packet, vortexing, hand shaking, and centrifuging. The top layer will be transferred to another tube (“dSPE tube”) with sorbent. Once all the samples were homogenized or pre-sieved, as in the case for the sediment samples, we aliquoted out the various samples we needed. For experiments, it is always good to have at least three replicates. Standards were used in the samples to analyze the recoveries. We then performed the extraction using the QuEChERS (“quick, easy, cheap, effective, rugged, and safe”) method, which consisted of adding salt packets into the samples, a lot of shaking, vortexing, centrifuging, and transferring. They were then evaporated using a machine called the “TurboVap” with nitrogen gas. Those evaporated samples were then transferred into a smaller vial filtered, and then transferred into autosamplers. SAV samples in dSPE tubes ready to be transferred to amber vials. Mind you, as Robert and I were doing our own extractions with the help of Tovga, the rest of the lab was also in full swing. We had Chau and Sabrina working on the water samples using solid-phase extraction (SPE). If you are interested in seeing the process for setting up the SPE for water samples and other things we have done: click here. And then, for a nice smelly treat, we also had Alex and Lisa homogenizing the fish samples and using the QuEChERS method to extract. And, remember that we also had to share the laboratory with the graduate students who has their own projects. During this time, we also had a faculty member mentor a high schooler who was also working in the lab. Space and resources were limited, and a lot was going on. The one thing you should always think about while working in a laboratory is safety and how you can contribute to the lab. So, on top of washing all glassware and supplies we have used, we also tried to wash other people’s as well. Everyone the lab has been so helpful and really cares about the projects going on and the science, which has really inspired me to do well. Transferring samples from dSPE tubes to amber vials. From the amber vials, they were evaporated using nitrogen. While the process may have seemed mundane, there were a lot of hurdles to go through. One of the main issues my team encountered was the fact that we did not have enough clam sample for our experiment. This is when I was able to explore science out of the laboratory and a classroom! In my quest for more clams, I coordinated with a member of the ecology team, and we both set out to sample for clams. Outfitted in waders, which are waterproof overalls, he taught me were I would have a high probability of finding clams and how to go about it. I would have to say that it was a daunting process at first because I did not expect the bottom of the Potomac River to be so muddy. At one point, I thought I would be stuck in the mud because I was about knee deep into the mud even though we were so close to the shoreline. Eventually, I got the groove of things and had a lot of success finding a lot of clams. In waders, collecting clam samples at Gunston Cove. Samples in the autosamplers meant that the sample prep was complete, and our focus then turned to sample analysis. The star of this process is the Potomac Science Center’s very own LC-MS/MS, which we have named “Keiko.” To put it simply, the liquid chromatograph part of Keiko separates out the chemicals in each sample, and their retention time can be used. Keiko’s mass spectrometer is the part that measures the masses within a sample. The data that comes out of Keiko can be used to identify and quantitate different chemicals. In our case, these are the chemicals that is widely found in pharmaceutical and personal care products. Some of these chemicals you may know with such as ibuprofen, amphetamine, penicillin, etc. Currently, this portion of the project is still in progress. Considering that I have never directly worked with an instrument like Keiko, I am learning a lot of new things such as setting up new methods and learning the software. The learning curve is steep, but Dr. Huff and Michael Gable, who is a graduate student has been helping us immensely. There were some more hurdles we had to face because a portion of my team’s samples were not showing expected results. Thank to Dr. Foster’s PhD student, Arion Leahigh, we were able to move through this issue and resolve it because she gave us her extra samples from the same sample trip. However, part of research is discovering how to work with the data that comes out. This was a major lesson for me having only been in a class laboratory setting where experiments are designed to always go smoothly. I learned that the path is not always clear, and you just have to problem solve and move forward with your head high. I am thankful to OSCAR and the PEREC family who have given me this opportunity to grow as a scientist. I am looking forward to analyzing our results and seeing what our data can tell us about our samples. It will be interesting to see how it connects with the ecology team’s project and how it can contribute to society. The majority of my time at the PSC has been spent dissecting the stomachs from the fish samples and opening them up to see what was inside. Each stomach from the fish species differed in some way both internally and externally. The most exciting stomach contents that I have found so far came from a yellow perch that had eaten five juvenile fish within the last day it was caught. I was able to identify the five juveniles as three white perch and two spottail shiners. 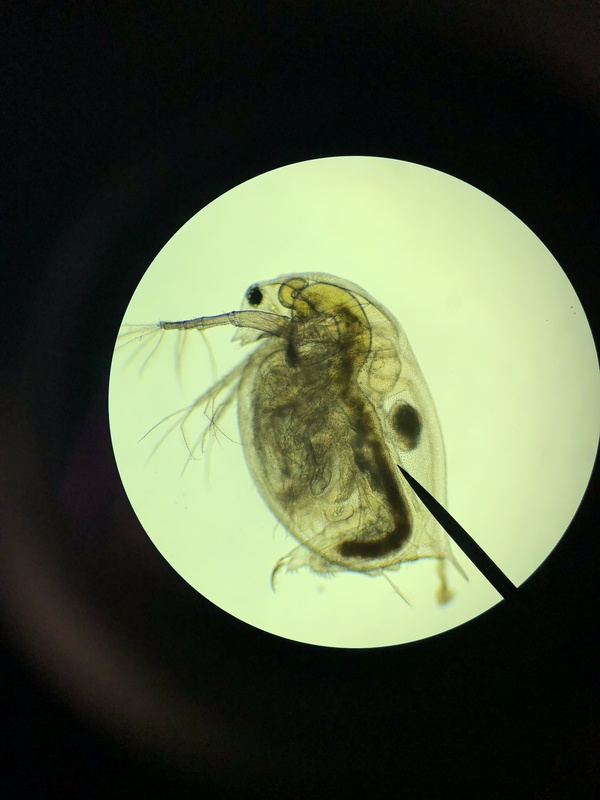 There have been various different prey items in the stomachs such as amphipods, chironomids, gastropods and aquatic insects that must now be analyzed. Using the stomach contents from each fish species, I will be able to determine which prey items are the most impactful as well as how location, habitat and fish species differ in diets. My time at the PSC and with OSCAR has been the most exciting summer during my undergraduate years and I hope that in the future I will be able to return and continue to work on related projects. 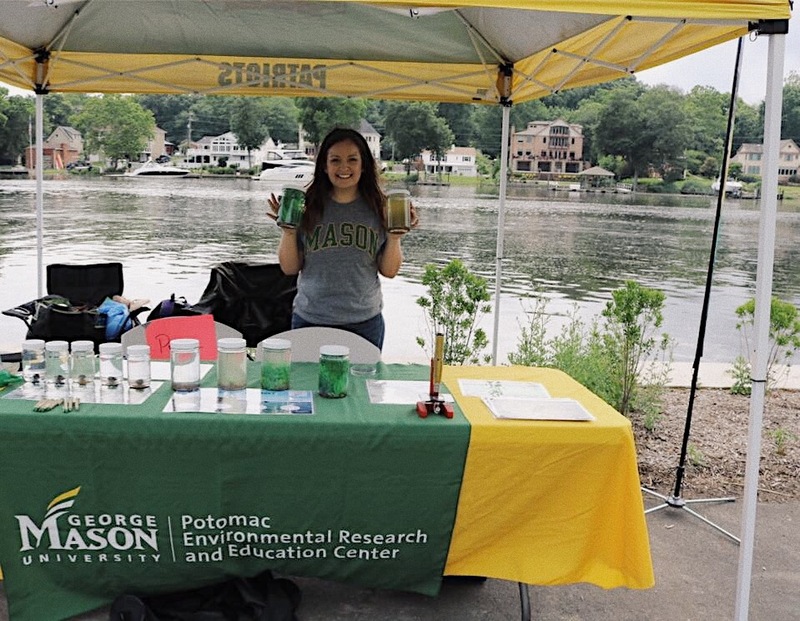 George Mason (https://www2.gmu.edu/) undergraduate research, led by principal investigators Amy Fowler and Kim de Mutsert, who are researchers at the Potomac Environmental Research and Education Center (Perec.gmu.edu). In the summer of 2017, this team project looked at the effects of micropollutants on the Potomac River watershed. Students and faculty discuss some of the results of the study and the future of this work. 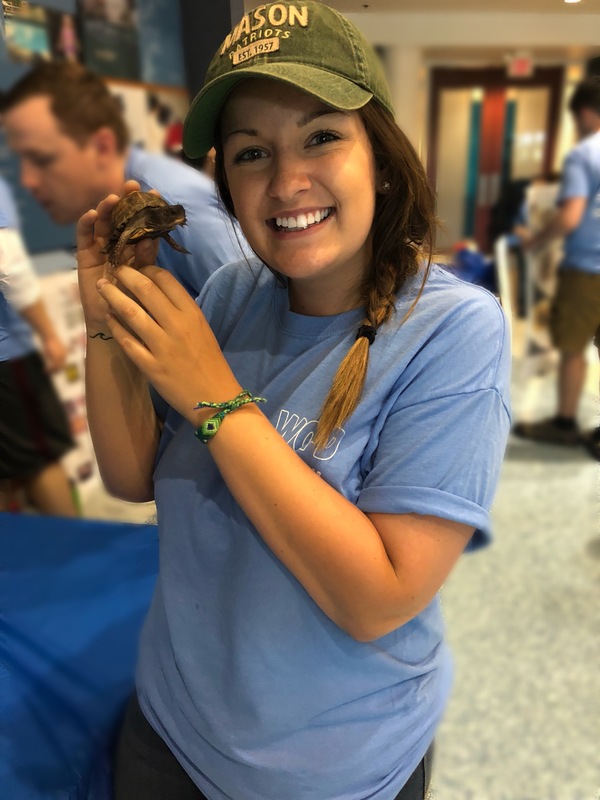 Projects were funded by the Students as Scholars at Mason (https://oscar.gmu.edu/) as well as the Patriot Green Fund (https://green.gmu.edu/patriot-green/) , and the videos were produced by graduate student, Chelsea Gray, thanks to the Virginia Sea Grant (https://vaseagrant.org/).